The metrics calculations are based on nearly 2.1 billion views. The stats are collected from 2200+ media servers (Nimble Streamer and Wowza). MPEG-DASH keeps growing, it had 8M+ views. It overruns Adobe HDS and it's getting closer to Microsoft SmoothStreaming. RTSP playback and re-streaming feature set gave a slight increase for this protocol with ~8% for now. HLS share is around 70% now. 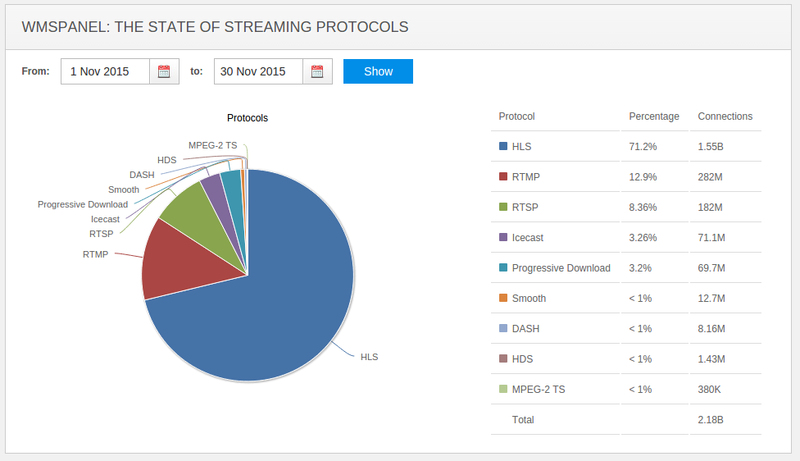 The State of Streaming Protocols - November 2015.